The statistics of the enchanted Blade of Woe are determined at the start of Honor Thy Mother, not when you first receive it. 00022BA8 0 (1) 400 0 (20) 7 N/A This is the unenchanted version that you first receive, at any level. It is a quest item, and therefore it is usually weightless and has no value. 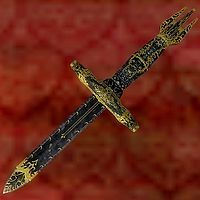 If, however, you kill Lucien Lachance immediately (thus preventing yourself from ever joining the Dark Brotherhood), the quest is completed and the Blade of Woe ceases to be a quest item. In this case, the weapon's weight and value will be those shown in parentheses. This bug is fixed by the Unofficial Oblivion Patch.. The Demoralize enchantment on the blade has no duration, at any level. Therefore, the effect will not actually work on the weapon - enemies will not be demoralized, and will not flee.